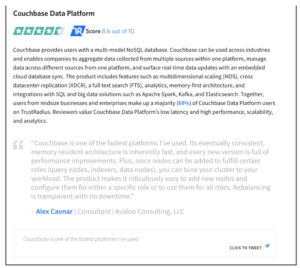 We’re excited to share that Couchbase has been Named Top Rated by TrustRadius in the NoSQL database category for 2019! Outranking our competitors, we’re especially proud because this award represents the true voice of the customer. Every user and review is verified and represents how our advocates value Couchbase. Since launching in 2016, the TrustRadius Top Rated Awards have become the industry standard for unbiased recognition of the best B2B technology products. Based entirely on customer feedback, they have never been influenced by analyst opinion or status as a TrustRadius customer. Read more about the award and how our competitors fared here. Share your love for Couchbase by leaving your own TrustRadius review and earn a $25 Amazon gift card; visit this link for more information.